it is a free simple table\’s browser, for microsoft sql server only for now, it works by connecting to a server, select a database, then all the tables,system tables and stored procedures within the database will be shown in the listbox, just click a table and the content will be put to the grid, default is the first 100 lines will put there, but it can be changed from the options menu. the content put to the grid will be shown fast, because of the virtual bound technique, you can do a search by click the find row menu, all the content match the criteria will be highlighted, right click on the grid to copy the content to the clipboard, other menus are plain and simple just play with it. i\’ve added the ability to create an insert, delete or update script, just like the sql query analyzer does, but i think in better view, because you can select which column to be included, just try by yourself, other is, it ables to browsing tables to see their content or their structural fields/columns, browse system tables, see the views and its script etc.. enjoy! find tables, i got a string, where the heck is it located? 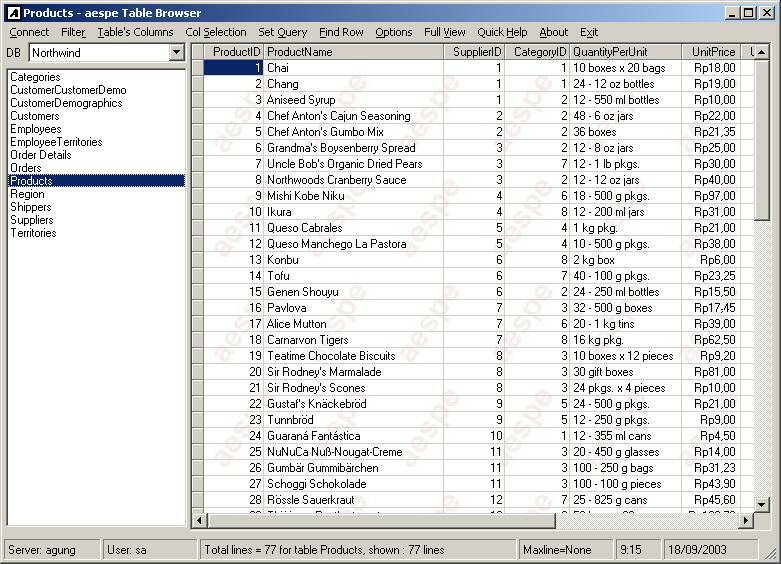 you supply information about table\’s name and column\’s name, and it will search all tables that have this of column, default, it will search column\’s name that partially match the search criteria, use \”[\” or \”]\” to find a macth column. Or you can supply a content string, so it will search entire database for tables that has column with content match the search criteria, it\’s very useful for me. full view, make the grid fill all form, can be use to comparison utility by open two aespe table browser, chose the table and click the full view option if you set windows to tile the two aespe table browser then you can compare the two content side by side. simple ! do backup and restore with ability password protected the backup file. COMCAT, MSCOMCTL, MSVBVM60, OLEAUT32 and COMDLG32 so be sure that they exists in your system.